January 15, 2016 by Ecommerce News. About Consumer behavior with tags Europe. 16561 views. 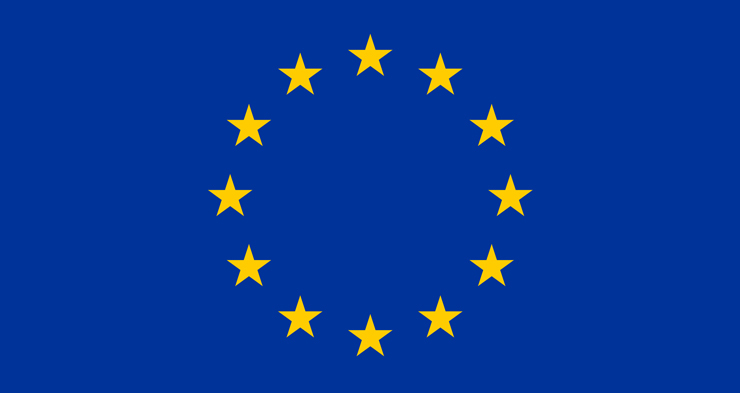 Nearly two thirds of internet users in the European Union made online purchases in 2015. The share of online shoppers in internet users is growing, with the highest proportions (both 68%) being found in the group of 16 to 24 year olds and that of 25 to 54 year olds. 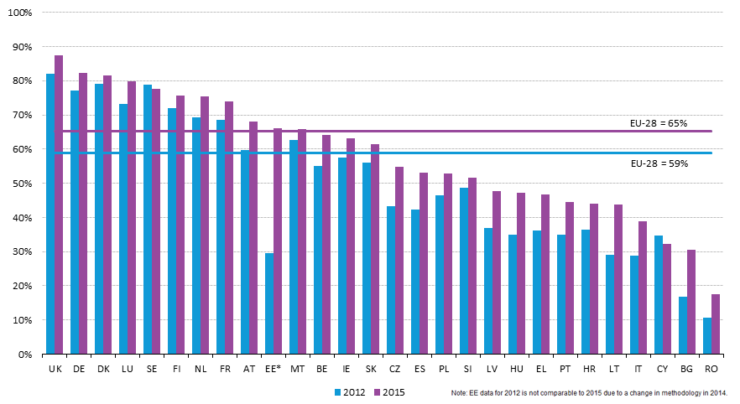 This can be concluded after some interesting research from Eurostat. It also found that the proportion of online shoppers varies considerable across Europe. In Romania for example, this share is only 18 percent, while in the United Kingdom it’s 87 percent. One of the targets of the EU’s Digital Agenda was that 50 percent of the population should have bought something online by 2015. This has been exceeded by three percentage points, as 53 percent of individuals aged 16-74 have purchased online in the twelve months prior to the Eurostat survey. 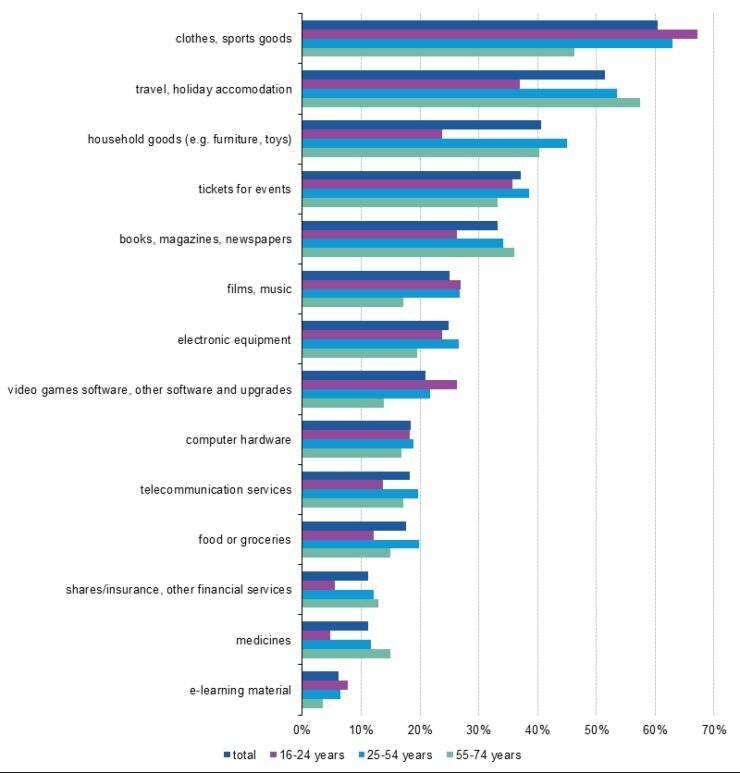 Clothes and sport goods are the most popular product categories in the EU, as 60 percent of online shoppers purchased one or more of these articles at least once via the internet. This is also the case for the group of 16 to 24 year olds, while in the older age groups household goods and travel and holiday accommodations were more popular online. According to Eurostat’s data, three out of ten online shoppers in the EU purchased across the border in another EU member state. This share (30%) was five percentage points higher than in 2012, when one in four (25%) e-buyers did this. As Eurostat puts it: “Cross-border online purchases can be an indicator of the smooth functioning of the single market for ecommerce and the extent to which consumers make use of wider choices and lower prices”. A large majority of online shoppers, 88 percent, made online purchases from sellers in their own country, which is three percentage points less than in 2012. 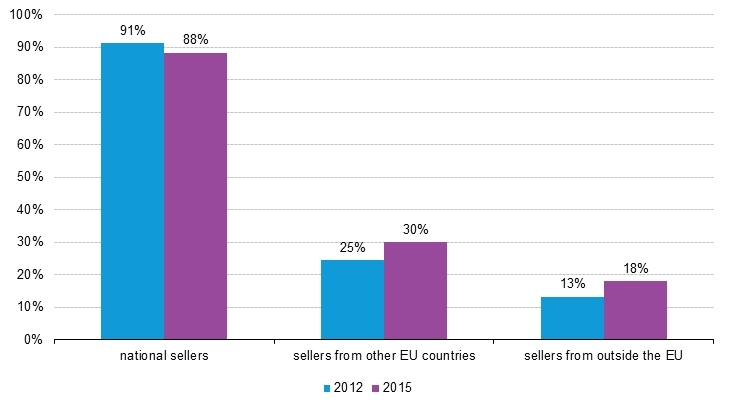 As said above, the share of purchases from sellers in other member states grew from 25 to 35 percent, and that from sellers outside the EU increased from 13 percent in 2012 to 18 percent last year.